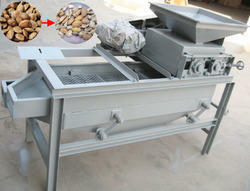 This is almond cracker machine which includes almond shelling machine and seperating machine. Almond Cracking Machine Crack almond Shell, and Almondskernel are separated from its shells. This Machine is so accurate that works without damaging Almond kernels. We offer advanced peanuts peeling machine, which is specially designed for removing the red skin coat of the peanuts and making the peanuts taste much savories. And at the same time, our peanuts peeling machine keeps the peanut kernels as integral as possible. It is an ideal peanuts shelling machine to deal with different sizes of peanuts. Two kinds of types are available: Dry Type Peanuts Peeling Machine and Wet Type Peanuts Peeling Machine. This peanuts peeling machine is also suitable for pine nuts, almonds, soybeans, broad beans etc. Features of Dry Type Peanuts Peeling Machine: The Dry Type Peanuts Peeling Machine adopts pneumatic principle and fully automatic digital control so as to deal with roasted or dried peanuts kernels with low broken rate and perfect appearance. 1. It adopts dry method, no water consumption and environmental pollution. 3. Labor and energy saving, simple to clean and maintain. Wet type peanut peeling method is quite different from dry type peeling which disposes roasted or dried peanuts. It is to peel soaked or immersed peanuts, almonds, soybeans, mug beans and broad beans. The unique residue separation device ensures clean and integral peanut kernels. The peeling rate of over 98%, high peanuts kernel quality. High integral rate, original nutrition is preserved. Peeling and separating of peanuts and coats automatically. Small in size, energy saving and high efficiency. Reasonable design and stainless steel material. Almond Peeling Machine Is one Necessory Peeling machine in Almond Processing Factories. We Offer Different Capacity to meet your demand. How can we Crack almonds fully without breaking inner kernel? It Depends on the gap almond Passing tough. Small almonds can not get cracked while Large. Almond Will be pulverized. So If you almond are in different size, you'd better grade them firstly. 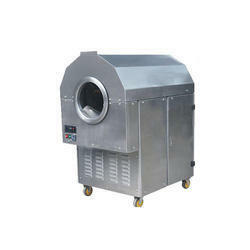 Almond Roaster Machine can suit for roast many oil seeds, like peanut, soybean, sesame, vegetable, etc oil seeds. after use this the oil seed is more easier got oil from oil press machine. Easier to use and operate. just use little power, save cost, have high capacity. 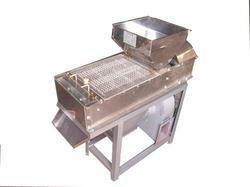 Peanut roaster machine can suit for roast many types seed. Lower price, high quality. Manufacture. Looking for Almond Processing Machine ?